1 Why Do Dogs Bark? Dogs bark for a variety of reasons. Some dogs bark for long hours for valid reasons. Some of the dog barking sounds signal discomfort. While some dog barking sound can be a source of serious concern. In order to stop dog barking, you need to understand why do dogs bark. But the barking dog does not mean the automatic activation of a barking collar. It all boils down to adequate dog training. First, you have to understand the reasons why dogs bark. The list here is not exhaustive. Dogs bark as a form of communication. The barking sound can be a warning to others, a sign of excitement during play time or a simple request for food. If your dog is well trained, it can bark on command or out of fear or jealousy. And some just bark to welcome you home. Puppies can bark for hours if they are left alone. They feel the need to belong to their owner. However, there are times when the dog barking serves a useful purpose. Examples include the detection of an intruder, or even dogs who can sense danger ahead of the owner. Fear: Dogs bark to protect themselves in threatening situations. Anything that poses a threat to them or YOU can cause them to bark. Getting Attention: Dogs bark as a request or demand to do something. It can be in anticipation for a dog walk or a delicious treat. Dogs can also bark when they feel a need to go outside to relieve themselves. Separation Anxiety Issues: Dogs with separation anxiety bark continuously when left alone at home. They exhibit behaviours such as destroying the home furniture, accidental elimination of waste and aggressive pacing. In this article, the kind of dog barking we wish to stop today are is the unnecessary barking. Barking that starts without valid reasons. Barking that starts at the slightest noise or movement. This article is not meant to stop your dog from barking entirely. The approaches introduced here allow the owner to control the barking, not to stop it completely. This is because your dog’s bark is the most effective way of communication with you. While using these techniques, it is important that you remember to remain calm and assertive. This confident disposition will allow you to take leadership and have control in the best way possible. The only way to earn trust and loyalty from your dog is to have confidence in your methods and actions. Reading your dog’s signals is vital to the success of the following methods. Though constant barking can be irritating, it is important that you stay calm when applying the methods listed below. Your dog can feel you are frustrated faster than you might think. And dogs do not follow a frustrated leader. If you stay flustered and frustrated, your dog will mirror that emotion. This might result in even longer barking sessions from your dog. So, before you try out the methods below to stop your dog from barking, take a deep breath and a few minutes to stay calm. These following methods are proven to stop your dog from barking. But it can take some time before your dog learns when is the right time to bark. Be patient and consistent. You will reap results in the long term and have a well balanced dog who will bark for only the right reasons. A dog that barks at strangers while having dog walks can pose serious threats to other dog owners. One of the ways to stop the barking is to gently close your dog’s mouth using a head halter. A head halter is a special kind of collar designed for dogs who like to pull people when they walk. It consists of a strap that goes around the dog’s nose. Another strap will go round the neck of your dog, behind the ears. Though the head halter looks restrictive, it does not cause any pain to your dog. One of the more popular brands of head halters is Gentle Leader and Promise Collar. Put the head halter on your dog. Whenever your dog barks unnecessarily, lift the leash. This will cause the dog’s mouth to close and will cause him to sit. Once he obeys and sit, wait for one second before moving off in a different direction. Different dogs react differently to head halters. You might encounter outright rejection of the head halter from your dog. Some dogs will start to shake their heads rigorously to avoid the head halter. Stay calm and use your normal verbal cues to get your dog to accept the head halter. Try to put on the head halter before a walk. As almost all dogs love to go for walks, your dog will soon associate putting on the head halter with a positive activity. You will encounter less resistance over time. So by using a head halter, you gain the attention of your dog and redirect his attention to a positive behaviour in a single step. Another effective way to stop dog barking is to get your dog to bring you an object. In this classic play of throw and fetch, you divert the attention of your dog and replace the barking with a task. This method only works if your dog understands the game play of “fetch”. Dogs enjoy completing tasks and pleasing their dog owners. It is near impossible to bark and fetch an object at the same time. Your dog will keep quiet while the object is in his mouth. However, do not present the toy when the dog is barking. This is to prevent your dog from thinking that the toy is a reward for barking. Another way to stop dog barking is to train him separately on occasions when he is NOT misbehaving. You need to attach a verbal cue to initiate the barking and another verbal cue to stop the barking. The usual reward during dog training will be treats. Some owners use verbal praises or a huge hug. Always present the reward a few seconds after the dog has finished the barking. Key is to prevent the dog from thinking that he is being rewarded FOR barking. To start the training, hold the treat in your hand and wait for your dog to bark. If your dog has a consistent barking problem, he will continue to bark non stop. Wait for your dog to stop barking and reward him with a treat. Soon, your dog will realise that if he stops barking, he will receive a treat. Add a verbal cue as a pre cursor to stop the barking. Soon, your dog will learn when is the time to stop barking. Once your dog has learnt the verbal cue to stop barking, you can begin to teach your dog the cue to bark. This order of training is due to your dog having a barking problem. If you try to teach your dog when to bark first, it is an uphill task. However, dogs with a barking problem does not really need to have the owner teach when to start barking. The key is when to stop the barking. Thus, you might not even teach your dog when to bark at all. But if you must, then you can create the situations when you want your dog to bark and reward your dog accordingly when he barks. Remember to give the stop barking verbal cue at the right time. Distractions break the concentration of dogs. When your dog barks, he or she is focused on the object causing the barking. By creating a distraction, you attempt to take his mind off the cause of barking. A piece of chain, marbles in a bag, or a can of pebbles can create sounds that distract your dog. These sounds will cause your dog to stop barking and focus on the new source of noise. When your dog barks, drop the noise making objects on the floor, visible to him. Soon, your dog will feel that the loud noise is an “occasion” that happens if he barks unnecessarily. Your dog will learn to avoid the “occasion” altogether by not barking anymore. Bear in mind that your dog should not relate the landing of the “object” to you but to his unacceptable behaviour. Do not throw the object at your dog but on the floor. We do not tolerate animal abuse and so shouldn’t you. Do not pick up the object immediately after. Let the object stay there for a while. Some of the useful barks your dog might have, such as going to the toilet or feelings of hunger, should never be subjected to the same treatment. Use your understanding of your dog to judge when is the right time to drop the “object”. Some dog owners prefer to let their dogs bark till they are tired. This is a very irresponsible way to handle a barking dog. It not only causes nuisance to your neighbours, but also reinforces this negative behaviour of your dog. When your dog is in a large area or a dog park, continuous barking can also embarrass the dog owner. Thus, it is advisable to walk your dog with a head halter and exert control over your dog once he misbehaves. In the public, it is important to stay calm and cool, maintain your control over your dog. Do not ignore the barking but try to stop barking gently. If you insist on the ignore method, make sure you have the patience to wait till your dog’s barking stops. If your dog barks for one hour, wait for an hour. If you yell at your dog anytime before he stops barking, he will think that barking for one hour will get your attention. This will result in even longer barks in the future. So, wait till the barking has completely stopped before you reward a treat for your dog. Some dogs bark non stop in their crate. Most times, its the dog owner’s fault. They keep their dogs in their crate for too long and never let them out for any walks. So, if you are one of the owners who refuse to let your dog out of the crate, one of the best ways to stop the barking is let them have some freedom time. However, never let your dog out of its crate when they bark. You do not want to relate barking with a positive outcome. Always stop the barking in the crate first. Only let your dog out when he has calmed down in a submissive state. Some dog trainers advocate the use of bark collars to stop barking. There are many different types of dog collars. Some emit a shot of air, some give out a noise and some use minor electric shocks. Though they are proven to work, we would not encourage the use of bark collars. Unless its absolutely necessary, you should confine to methods of positive training. Because bark collars add a punishment to the undesired behaviour, we do not accept this form of correction. Not only is this unacceptable, having shocks to your dog might cause other behavioural problems to arise in future. Many times, a dog misbehaves because he does not respect the owner. The owner is not viewed as his pack leader. The relationship between you and your dog needs to be nurtured. Through proper dog training methods, you should be able to lead your dog to the correct behaviour. Set boundaries in your dog’s behaviour. Practice good communication with your dog. Teach your dog that not all behaviours are accepted by you. Dogs behave like kids at times. If you do not set the boundaries, they will keep stepping over the line. Tell your dog to “stop” at the sign of any unacceptable behaviour. Get your dog to understand the word “stop”. Soon, you will be able to control your dog’s barking simply by using the word “stop”. Identify the cause of your dog barking. Write down the different situations when he starts barking. For example, if he likes to bark at passers by during his walk, stop the walk immediately when he starts to bark. Do not commence the walk again till he is in a submissive state. Soon, your dog will realise that the barking is an unwanted behaviour. You can repeat this for other behaviours. However, this method of removing the cause of barking can only be a temporary solution. Another way to get your dog to stop barking at a stimulus is to let him get used to it. Bring the stimulus to him multiple times. Reward your dog when he does not bark at the stimulus. For example, if your dog keeps barking at the arrival of your friend, get your friend to appear multiple times. Reward your dog whenever he does not bark. Soon, your dog will know that barking is an unwanted behaviour when your friend appears. This will discourage your dog from barking eventually. Your reward can be in the form of treats or verbal praise. Be sure to reward at the correct timing when there is no barking. Be patient with this method as it can take weeks or months to wear off the barking of your dog to each stimulus. To stop your dog from barking, get him to do another action which requires him to stay still. One favourite command to stop dogs from barking is the “lay down” command that instructs your dog to lie down. By commanding your dog to lie down, the action does not permit continuous barking. Another good command is the “bang” command, where your dog is supposed to “play dead” to a gun shot. This method requires your dog to be trained for the “down” or “bang” command. Another way to prevent your dog from barking is to extract all his energy. If your dog has a lack of exercise, the pent up energy trapped within will cause him to feel restless and bark continuously. One simple solution is to get your dog to go for more dog walks or longer periods of exercises. Another way is to play more rounds of “fetch” with your dog over longer distances. Boredom and frustration are the two major causes of dog barking. A tired dog should not bark as much. Remember to bring enough drinking water for your dog to provide adequate hydration. Dogs are social animals. 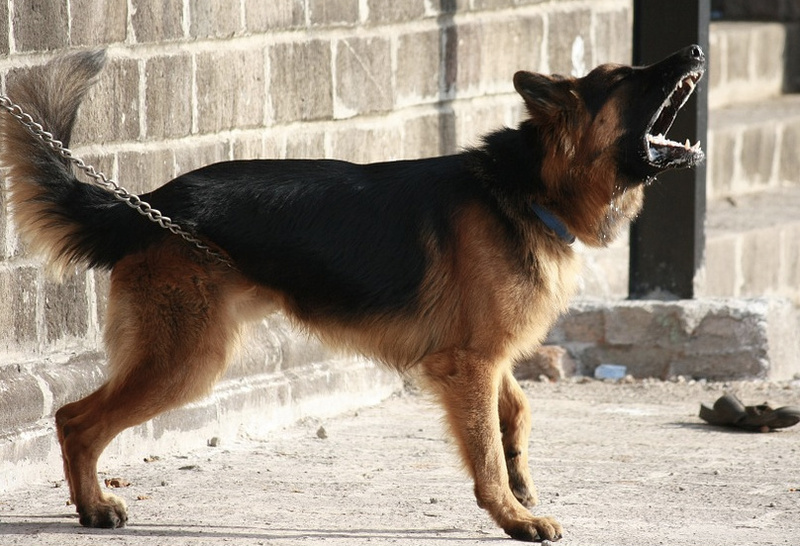 If you keep your dog chained up for the whole day, you will face an uphill task keeping it quiet. Dogs need companionship and friends. Take time out to bring your dog to the dog park daily to make new doggie friends. Some examples of socialising include bringing your dog to walk in your neighbourhood. The fresh sights, smells and sounds will keep your dog’s senses active. The external stimuli will not be so startling for your dog. This will help to keep your dog calmer and less likely to bark unnecessarily. If all else fails, the last resort is to get a professional dog trainer. A professional dog trainer is able to point out the shortcomings quicker, thereby solving your dog barking problem sooner. Follow the instructions given by your dog trainer closely. Most likely, your dog trainer will list down a series of steps to follow through for the next few weeks. Make sure you adhere to the instructions laid down. The success rate depends greatly on your follow up actions, not the few minutes your dog trainer spent with your dog. When you offer rewards for the command “stop barking”, make sure the timing is right. If you offer the treat immediately after your dog stops barking, it will encourage your dog to bark more often. This is because your dog receives the reward immediately after the barking. Offer the treat 10 seconds after your dog has stopped barking. This enables your dog to relate the treat to the action of NOT barking. The timing of offering the treat is crucial in your success. We hope the above tips will help you to put your barking dog at the right place. Stopping dog barking can take weeks or even months. With the right technique and patience, you will transform your barking dog to an obedient dog in time to come.